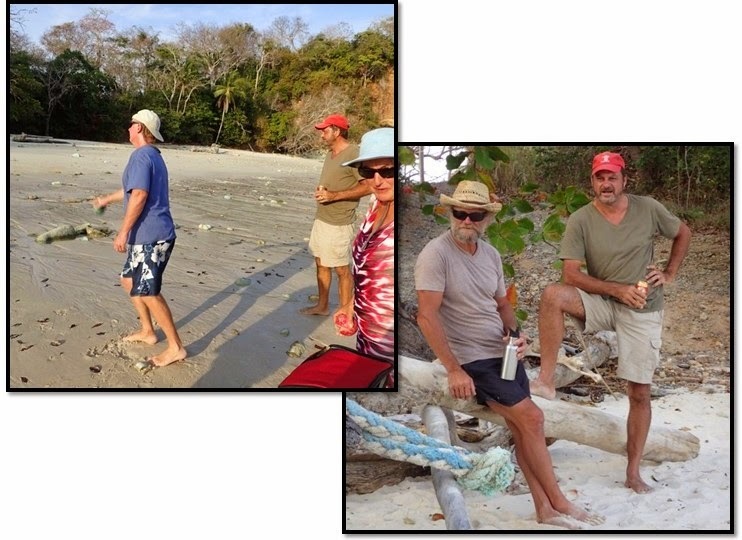 On Panama's idyllic Ilsa Contadora, we enjoyed a game of beach bocce ball with fellow cruisers Randy and Dawn Ortiz of Nirvana Now. Randy was a ringer; Dawn, incredibly sweet. "Watch out for Nirvana Now - they're in your area and sinking!" Satellite-SMS-ed Julie from Kia Ora. As in most disasters, initial information is alarming, confusing, insufficient and somewhat contradictory (likely including some info in this blog post). Julie gave us a rough location, which seemed implausible given Nirvana Now's 10+ day lead on us as they bypassed the Galapagos (where we spent 10 days). We weren't 100% sure when Nirvana Now began floundering, or if their boat was still recoverable (Wayne believed perhaps his mechanical prowess, tools and repair materials might save the day). We didn't know their exact location. We'd heard at least 2 and perhaps 3 boats were either already there or on their way. Unsure of whether or not we could help, we made a u-turn and headed their way. After a few hours, it appeared we were not needed, and we turned again, resuming our course. 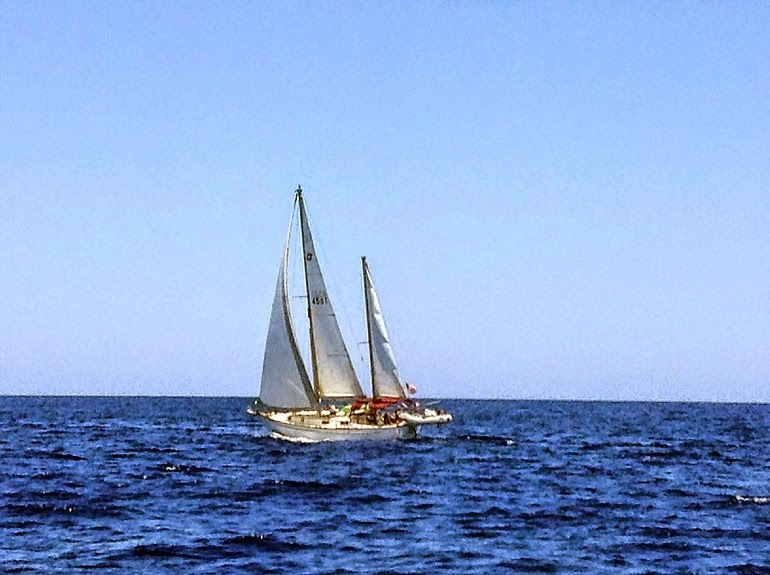 Over the next 12 hours we learned Dawn and Randy were rescued via super yacht schooner Athos and sailboat Continuum, but that Nirvana Now sank. Rescue efforts were facilitated via a mix of technology - ham radio networks, satellite phones and Wi-Fi hotspots, EPIRB (distress signal coupled with GPS location data), VHF radio, coordinated between Pacific Puddle Jump (PPJ) organizers and participants (209 boats, including Nirvana Now and us) and the Coast Guard. PPJ organizers had everyone's contact info, most of their location data and a listing of their communication and emergency equipment. They rapidly deployed that information accordingly. Our hearts go out to Randy and Dawn for their devastating loss. Our guess is their boat is uninsured (like ours - older boats are often difficult and impractically expensive to insure). If so, it's a significant financial setback, though likely not much worse than a moderately bad day in the stock market. At least,Randy and Dawn still own a home in the Edmonton Canada area - someplace to go back to. Far more difficult is the emotional loss... The sense of helplessness, and most likely the loss of a beautiful dream... Independently traversing the high seas to explore remote and magical places. by Randy and Dawn's loss. Even though our boat's not prone to the specific mechanical issue that sank Nirvana Now, we accept that some other freak disaster could strike us, too. And yet the everyday courage required in taking these calculated risks are part of what makes life worth living. Even if we weren't in the midst of a 3,000 mile open ocean passage, we risk our lives every time we get into our cars to buy groceries or head into work. We risk our hearts in every meaningful relationship we build. We risk our very essence by refusing to dream, or refusing to follow our dreams. For us, foregoing that risk would be the greatest tragedy of all. (including ours) making passage to Galapagos (us) or the Marquesas (the other 4 boats - we were heading there after Galapagos). The nearest landfall? Roughly 1200 miles away. Their vaguely-estimated location was 4-5 hours from us, less than 21 miles away, behind us. The silver lining in this nightmare is thanks to all that and the heroic efforts of Athos and Continuum's crew, Randy and Dawn survived, even if their boat did not. The ragtag emergency assistance system works. Does this tragedy discourage us? More importantly, send your heartfelt condolences to Randy and Dawn as they recover and rebuild their lives. And for you, do not be afraid to dream big, and live your dream. We were incorrect - Nirvana Now did not have a spade rudder. They experienced some freaky conditions. Our best guess is an isolated sea mount combined with unusual turbulence. We were near and yet completely unaffected by those conditions. Dawn and Randy were insured, and flew out of Hiva Oa a few days before we arrived. "They're tough as nails," said Bob of Continuum, who rescued them. Bob seems to be making a habit of this - he and Dave from Anahata towed us into anchorage from 2 miles out of Hiva Oa. More about that in a future post. Read Latitude 38 for more on the story of Dawn and Randy of Nirvana Now - click here. Also on Latitude 38 - Randy and Dawn tell their own story - click here. We arrived after 32 days at sea and over 3,000 nautical miles in Hiva Oa, Marquesas, French Polynesia (anchorage latitude, longitude coming). We are catching up on 36 days without internet access - much more to post soon! I'd love to learn more about what caused their boat to sink. I'm not morbid, I just want to learn from other people's experiences if possible so I can avoid the heartaches. Thanks, congrats on getting in, and I hope Wayne gives us a full report on that motor. Best we can figure is they hit something really freaky ... which did not affect us at all desptire being close. Wayne theory is a sea mount. Bob, from Continuum told us the water was "boiling" (motion - not temperature) and the only way he could take them on board was "one shot" from Nirvana Now's dinghy to Conitinuum's boat. No pont it taking down the rescuer or risking the crew o Nirvana Now!